Parker Kligerman had some bruising but was okay and is working Sunday's race for NBC. Restrictor plate NASCAR racing has a lot of variables. That’s a reason why fans love it and it’s so entertaining, you never know what will happen each lap. Jim McKay talked about the “thrill of victory” and the “agony of defeat” and the difference between those two things may be a matter of inches at Daytona and Talladega. NBC Sports pit reporter Parker Kligerman experienced both sides of that phrase at Talladega. Last year, the part-time racer won the Camping World Truck Series race, his second career win (both at Talladega). This year, things didn’t go as well as Kligerman was caught up in the “Big One,” the big crash that usually happens at some point in races at Daytona and Talladega. As Chris Fontaine and Justin Haley tangled going for second place, it started a chain reaction that collected most people directly behind them. When that happens, nobody has anywhere else to go and you’re kind of along for the ride. The crash was the scariest for Kligerman. Kligerman’s first hit into the wall caused the throttle to stick in the #75. That started the scariest thrill ride Kligerman has ever been on as he became a passenger careening into the inside wall. When it comes to crashes, hits like that are usually some of the worst. Cars can flip and spin and all that and while it looks horrible, that at least dissipates some impact. While it’s still dangerous to flip, a near head-on hit into the wall is usually worse. Kligerman got out of the truck under his own power but was certainly feeling it. The extent of Kligerman’s injuries was a bunch of bruising but one pic he showed could have been worse. Ouch… those hurt. Thanks all for the tweets, I’m good just very bruised on the knees and I found a lovely one on my left heel. But def could have been worse. Sad we couldn’t defend the win from last year, but we know we had a truck capable. Hope the show was worth watching! 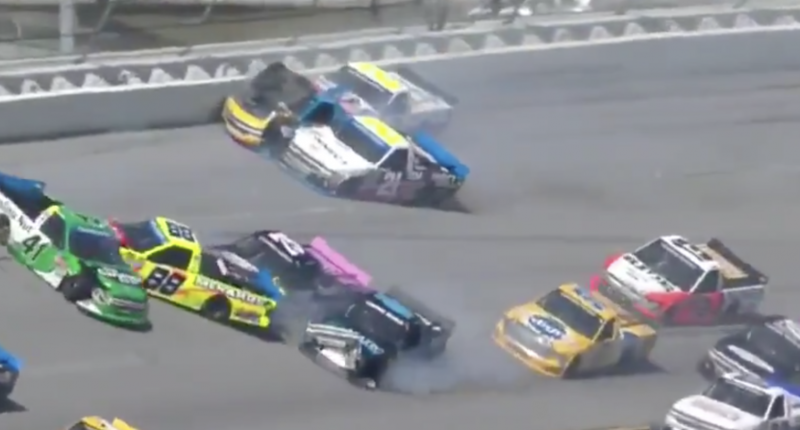 Those are the pedals in Kligerman’s truck and the force caused that and the firewall that keeps the engine from going into the driver compartment to slightly move toward Kligerman during the crash. When it comes to crashes like that, you want to make yourself as small as possible and get your hands off the steering wheel. Kligerman went one step further and pulled his feet away from the pedals. Doing that likely saved Kligerman from potential broken bones and even though he’s limping today, he is working the pits for Sunday’s Monster Energy NASCAR Cup Series race.